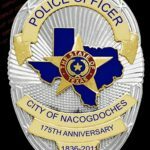 NACOGDOCHES — Nacogdoches Police are searching for the gunman responsible for killing one person Thursday night. According to our news partner KETK, authorities were called around 8:00 to the 2200 block of Lola Street in reference to a report of a gunshot victim. Officers found Damien Wade, 18, of Nacogdoches, dead from a gunshot wound. No arrests have been made. Anyone with information about the shooting is urged to contact the Nacogdoches Police Department at (936) 559-2607.